PTFE tubing is the most flexible of the three fluoropolymer tubings. This product handles temperatures ranging from -79 to 260°C (-110 to 500°F) in continuous service. It is translucent milky-white to white in appearance, depending upon the type of PTFE resin used in manufacturing. Batch process manufacturing limits lengths, depending upon the size of the tubing. PTFE tubing has excellent chemical resistance properties and can be used with almost all chemicals and solvents. 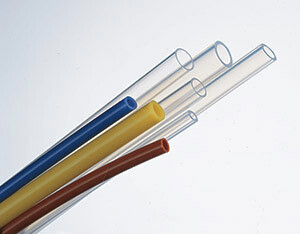 PTFE tubing is FDA approved. 참고: Specifications given are typical. Field testing is recommended to find the actual operating specifications in the given application. Sold by standard coil length only. PTFE is coiled in 25-ft. (no-splice) package, 50-ft maximum (two-splice) package, or 100-ft maximum (three-splice) package.